Zhiping Lin received the B.Eng. degree in control engineering from South China Institute of Technology, Canton, China in 1982 and the Ph.D. degree in information engineering from the University of Cambridge, England in 1987. He was with the University of Calgary, Canada for 1987-1988, with Shantou University, China for 1988-1993, and with DSO National Laboratories, Singapore for 1993-1999. Since Feb. 1999, he has been an Associate Professor at Nanyang Technological University (NTU), Singapore. He is also the Program Director of Bio-Signal Processing, Valens Centre of Excellence, NTU. 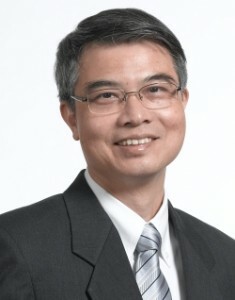 Dr. Lin is currently serving as the Editor-in-Chief of Multidimensional Systems and Signal Processing after serving as an editorial board member for 1993-2004 and a Co-Editor for 2005-2010. He was an Associate Editor of Circuits, Systems and Signal Processing for 2000-2007 and an Associate Editor of IEEE Transactions on Circuits and Systems, Part II, for 2010-2011. He also serves as a reviewer for Mathematical Reviews. He is General Chair of the 9th International Conference on Information, Communications and Signal Processing (ICICS), 2013. His research interests include multidimensional systems and signal processing, statistical and biomedical signal processing, and more recently machine learning. He is the co-author of the 2007 Young Author Best Paper Award from the IEEE Signal Processing Society, Distinguished Lecturer of the IEEE Circuits and Systems Society for 2007-2008, and the Chair of the IEEE Circuits and Systems Singapore Chapter for 2007-2008.